As I examine this idea of becoming a researcher in action, a teacher with an inquiry focus, I’m clarifying what is possible, potential and impactful. I’m shifting from the possible to the actual. Keeping the reasons in mind, I’m narrowing the focus down a specific track that lays out a path for a specific outcome – how might students use professional blogs and commenting on blogs as a means and mechanism for building a professional learning network. This fits into the reason – conversation (as held in text messages on blog sites) and relationship (finding others that could become members of a professional PLN). Starting with the why, I’ve now examined the who, what, where, when and how. I’ve looked at the mechanisms and methods that could potentially provide the information I’ll need to analyze and examine connections in the ‘evidence of learning’ – how students will show what they know and what they can do. 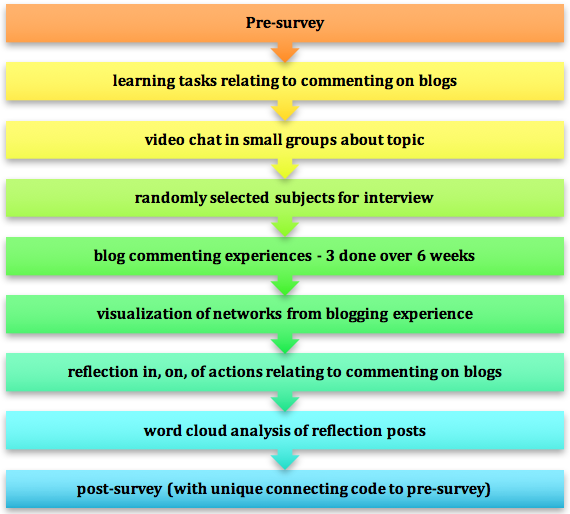 It relates to using commenting on a series of blogs while increasing the level of engagement and interactions, expanding awareness and range of blogs on which students can potentially comment, and requiring reflection in, on, and of actions relating to the act of commenting on blog posts.